96 pages heavily illustrated with line drawings and photos. 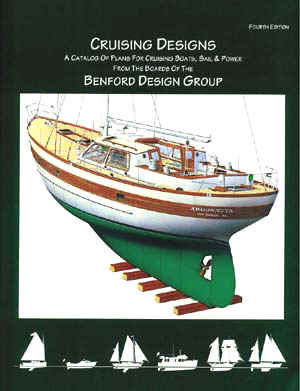 First published in 1975 and since become a classic of its kind, Cruising Designs is a collection of basic boat plans of a variety of Benford designs, ranging in size from 7 to 131 feet in length, selected from the custom designs created over the past three decades. It is designed as the spark to fire one’s ideas about the sort of boat one really wants or to suggest an idea for a new boat. The fourth edition includes a number of designs new since the third edition. Heavily illustrated with photographs and plan drawings, Cruising Designs is a classic wish book. From the Introduction: "Our favorite occupation, and the one that fills most of our time, is the creation of custom designs for yachts and commercial vessels. Each design is drawn up to fill the special needs of an individual client. Thus, our plans are for those who want something more than that which is available in stock boats...We hope the illustrations in this book will entice you to delve further into our designs. We're having fun creating them and find boats to be a grand way of life...Perhaps one of these vessels will be the spark to fire your ideas of the boat you really want."